Hypothetically speaking, let’s say you walk out to the pasture to find your equine companion with what appears to be a relatively new laceration. It’s a scenario all horse owners have faced at one time or another. So what do you do? 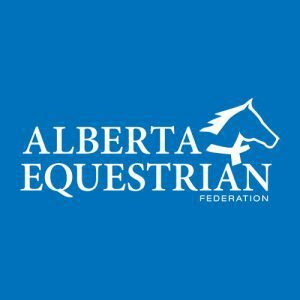 Today, veterinarian, Dr. Jeremy Ross of Estevan, SK, gives us 4 things to consider about equine laceration first-aid – quickly – before taking action, and advice for long term management. You first have to evaluate what's a minor injury and what is more of a concern. 1. HOW MUCH BLOOD IS THERE? 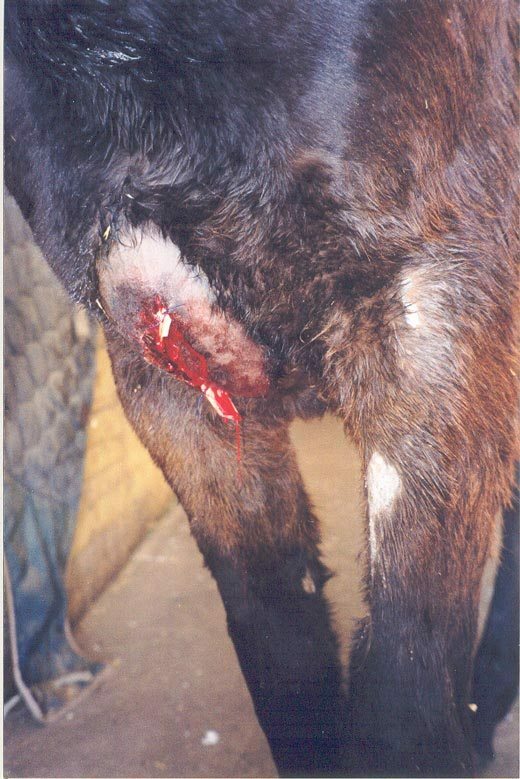 If your equine companion gets a laceration or cut, the first and most important concern is hemorrhage/bleeding. Although 90% of the time bleeding is minor, and nothing to worry about, the other 10% can be very scary. However, that’s not to say you should panic at the sight of blood. If you have ever spilled a full glass of wine on the floor, it makes a large puddle – and that’s only about 200 mls of fluid. 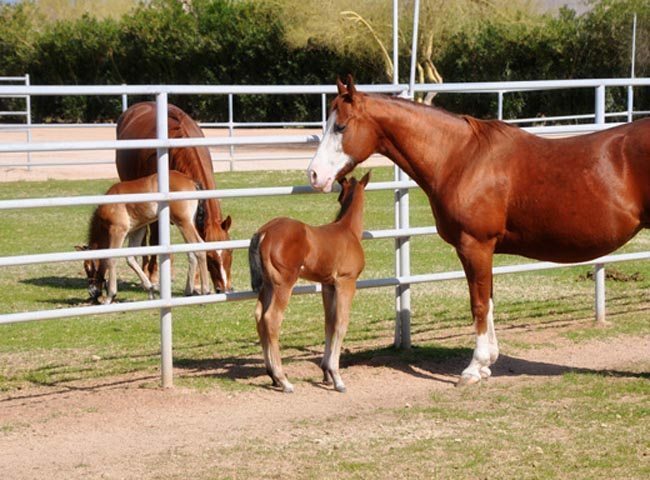 An animal’s body is 10% blood (that’s 50 liters for the average sized horse). Animals won’t become shocky until they lose over 10% of their blood – which is over 5 litres. Pour 5 litres of red paint out on the barn floor and see how much floor it covers! I remember riding around with an old vet once, when he got a phone call from a client in a panic about her bleeding horse. He asked her if she could catch the bleeding in a coffee cup. She said “Yeah…?” in a confused voice. Then the old vet told her, “Good. Call me back when the cup is full.” I thought that was a little crude, but it made a good point. Nonetheless, extreme bleeding can occur. And you will know it if it happens. Profuse bleeding is akin to turning on a high pressure tap and often means the laceration has affected an artery. 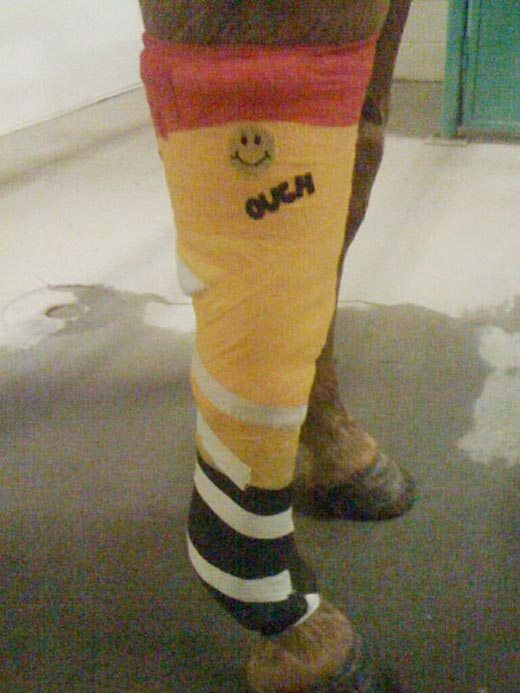 If this ever happens to your horse, pray it occurs on a leg so you can use a tourniquet – this is the only time I approve of using electrician’s tape (black tape) on a horse. On the cut leg, wrap the tape (or another type of tourniquet) tightly above the wound. That may be good enough to stop the bleeding. But if not, apply pressure to the area with gauze or bandage material. Then place a pressure bandage over top of that bandage. 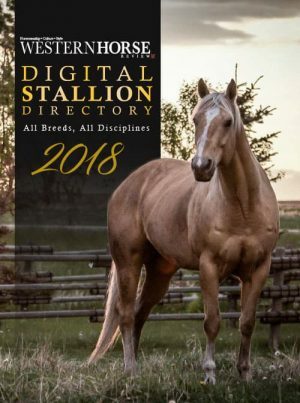 At this point, your horse will likely be alright until the vet arrives. The vet may be able to place a hemostat on the artery and ligate it (tie it off) with a suture. Some horses – because of the body’s ability to naturally constrict its blood vessels – will be done bleeding by the time the vet gets there. Take the black tape or tourniquet off as soon as possible. 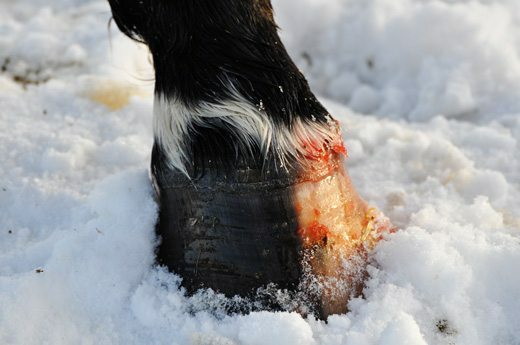 A tourniquet tied on for too long can cause permanent damage to the blood supply and the loss of the horse’s limb! 3. 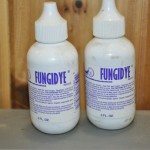 SHOULD I USE BLOOD STOP POWDER? 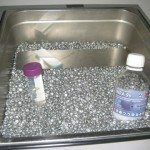 Blood stopper or corn starch will slow minor bleeding. 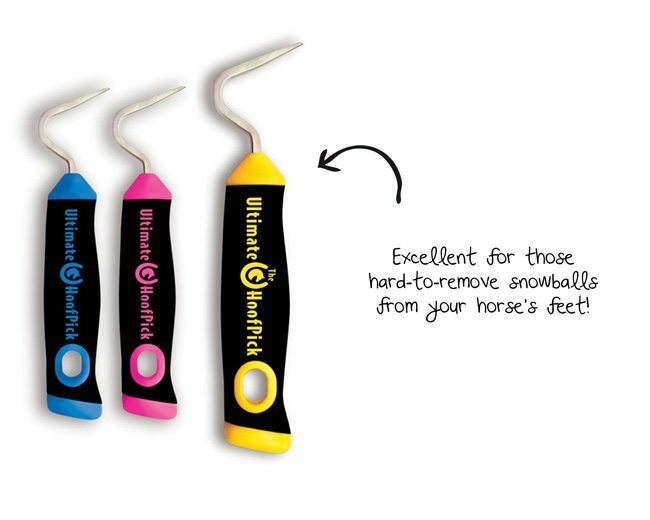 I prefer to only use this on oozing blood from a hoof injuries that are difficult to pressure bandage. Otherwise, blood stop powder or corn starch make the wound very difficult for your veterinarian to assess, clean and stitch up the wound if necessary. A regular clean bandage application is best. For wounds on the body that are oozing blood, I would rather leave them alone than put blood stopper in the wound. After the bleeding isn’t a concern the next thing for your vet to consider is whether or not to suture the wound closed. Most of the time the right answer is not. That’s right – not suturing a wound is okay. Your veterinarian will know if closing the wound is appropriate depending on when it occurred, where it’s located, how it happened and how it looks. Sometimes us vets take a chance and suture a wound closed (usually because that’s exactly what the owner wants to do) and we get lucky. The sutures hold, and less than 2 weeks later the wound healed. However, suturing has its risks. This is is especially true if the wound is old, contaminated, in a bad location on the body, or if sutures would make the wound too tight to close and put too much tension on the wound borders in doing so. If you demand that your vet sutures the wrong type of wound, there is the possibility that this choice could turn against you, tear open and delay proper healing. Suturing a wound depends on when the injury occurred, where it’s located, how it happened and how it currently looks. Sometimes it's necessary for the wound to be able to drain itself. Most of the time, having the wound surgically debrided (trimmed up) and left open to heal is ideal. Of course, good wound management is key. As the caretaker of the horse following the accident, you will need to keep the wound clean and moist. This can be accomplished by applying a proper wound product and bandaging it, if it has occurred on the limbs. 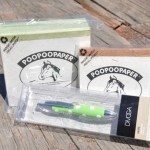 What’s the proper wound product? Beware of what you hear. Things like meat tenderizer, transmission oil, lye, etc. or other “home remedies” are not ideal. Products that are more tissue friendly help to speed up the healing process such as DermaGel, or a formula made up at most vet clinics called “Green Wound Cream.” This cream contains various ointments and antibiotics, but more importantly it contains a corticosteroid that prevents the formulation of exuberant granulation tissue – otherwise known as Proud Flesh. 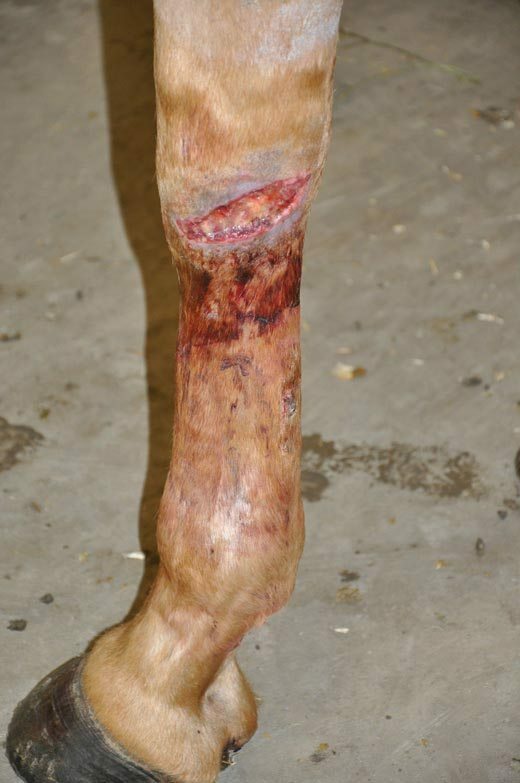 Proud Flesh is only a concern on wounds below the joints because wounds almost never get proud when they are above the elbow or stifle of a horse. 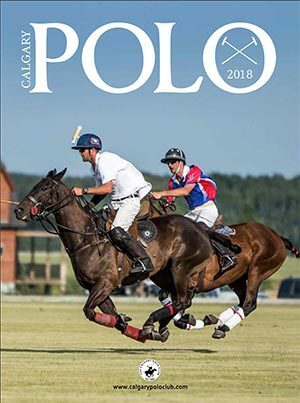 After the wound has been cleaned, sutured and bandaged (if that’s what the vet thought was best in the scenario), it is a good idea to give your horse a tetanus booster and a short regime of penicillin. In the days following, it is very important to watch and see if your horse becomes suddenly very lame 3-5 days after the wound occurred. If so, that can mean a joint or tendon sheath infection has occurred. Call a horse vet asap. 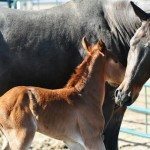 If your horse truly has a joint infection, aggressive antibiotic therapy in needed and even after treatment some horses will have permanent damage and be lame for life. You can review your horse’s anatomy and get to know areas that are the joints and tendon sheaths. However, it may be difficult to know where all of them are as some joints have pouches that extend beyond their logical location. Therefore the morale of the story is to watch for severe lameness a few days after the injury. And if in doubt, call a vet! I would also like to add that small wounds can sometimes be the worst offenders. It might not look bad to the naked eye but I have seen puncture wounds where a 1 cm cut is actually inches deep. The infection from these wounds can be severe and overwhelming. Septic shock, tetanus, infected joints, etc. can occur as a result of them. If a small wound becomes very swollen and/or discharging, it may have a foreign object(s) inside causing it to fester. Your veterinarian may have to do surgery to explore the wound. Antibiotics, anti-inflammatory drugs and tetanus boosters are very necessary in these types of situations. A vet who can inject joints can test to see if a joint has been opened or affected. This is done by irrigating sterile saline into the joint opposite to the wound and watching for fluid leaking out of the wound. Some injuries cause too much swelling and the vet may be unable to locate joint injection site. Lastly, beware of bone sequestrums. This is what occurs at least 3 weeks after a wound occurs near bone. If you thought your horse’s wound was almost healed, then it flared up and looked worse again, it’s possible he could have bone sequestrum. Your vet may have to surgically debride the bruised bone away before the wound can completely heal. Overall, most wounds are alright and heal with basic wound management. Few are really scary. Always have a first-aid kit prepared and ready to go in your barn. If you don’t know what an equine first-aid should entail, ask your vet to help you get it ready. And remember, if all else fails call your vet. Be prepared to be administer first-aid treatment by yourself initially. As a vet, I will admit that we can’t always be on time, and we can’t be there immediately. OK Jenn – when I see 911 right beside the twins picture… it got my heart racing. 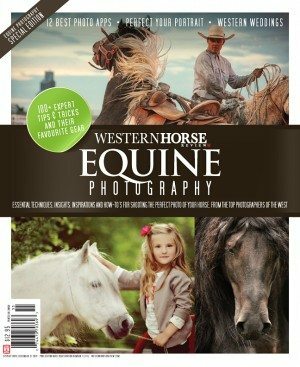 All the same, a very good article for those looking after horses or any animals. (Although, in my case, a ‘full’ glass of wine is more than 200 mls…) HA HA! !